Summer is just around the corner and that means it’s grilling time — oh wait, I take that back despite my wife saying I’m crazy I’m grilling all year round. Snow, rain, hot weather — cold weather it really does not matter to me but I love grilling. Always looking to get that perfect cooked meat or vegetables along with those photogenic looking grill marks I was looking for a product that could achieve better results than the small steel grates on the grill that would not stay very hot, does not give that sear marks like I love either. 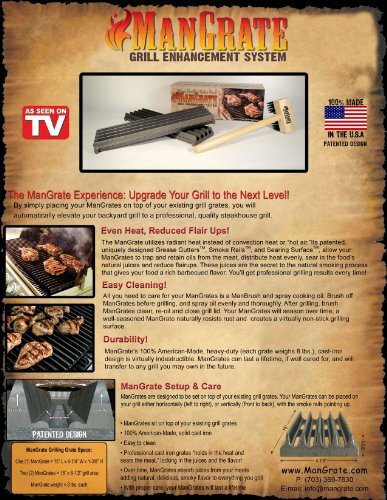 I was in luck — I saw an advertisement in a magazine for the “ManGrate” which is a set of cast iron grill grates that sit on top of your current grates. I had to have them and put the ManGrate to the test. The ManGrate arrived and they are very heavy, well, cast iron so of course. Setup of the ManGrate was very easy take them out of the box place on a cold grill and then you need to season them — just like other cast iron products. They recommend you use a cooking spray like Pam or Olive Oil to season the grates and once coated to crank up the heat on the grill for about 15-20 minutes. After that you are ready to grill! Since the cast iron tends to stay hotter longer and hold the heat much better you should drop the flame down to a medium heat for cooking. As seen in the video I tested a few different things on the grill including chicken thighs, pork chop, hotdog and some vegetables too. The second I placed them on the ManGrate you can hear that lovely sizzle and sear sound. The vegetables, pork and hot dog started to get marks almost right away but since the chicken is oddly shaped that was not really happening. However, everything was cooking a little more different than usual and it looked really good. The chicken skin started to crisp up and get a nice golden brown color — more even than just on the normal grill grates. I cooked everything through and it all came out delicious — I think it also helped to cook everything more evenly as well too. The following night I had another pork chop recipe that I wanted to try which actually was really simple. Coat the chop in canola oil and season with Chile powder, salt and pepper and grill’em up! Brought the grill up to temperature, dropped back down to a medium flame and placed the pork right on the ManGrate. I’m not sure if it’s because of being cast iron but meat sticking to the grates has not been an issue — perhaps because of the higher heat and better distribution of the heat…. I almost always have meet stuck to the grill even with the cooking spray — so that was awesome too! 5 mins on each side of the pork chop with a quarter turn at 2 1/2 minutes to get those perfect crisscross sear marks. Ten minutes later the chops were done — and the looked excellent! Not only did the color look great, but they were plump and juicy too. Took the chops off and let them sit for a few mins to redistribute the juices and it was time to eat. The reaction — everyone love the pork chops and kept asking me how I cooked them — so of course I showed them my ManGrate which they were all intrigued. After only grilling up a few things — I’m already in love with the ManGrate. Clean-up was a cinch and if you see rust starting to form just cleaning it up and re-season them again…and you’re good to go. My only complaint was that I wish there was a way to lock the grates in place when you put on your existing plates — yes they are heavy but they would still move — mostly when cleaning them, but this is really not that big of a deal. I’m looking forward to grilling up some burgers and salmon to see those results as well but already can imagine how they will turn out! The cast-iron ManGrate is the perfect add-on accessory for any grill-master and I give the “ManGrate” 4.5 stars and one Damn Good Review!